Will 2013 be the Year of Environmental Security? Happy new year, folks. The Mayans were wrong, and I hope you haven’t cashed in the retirement fund. We’re still here. And yet the rhetoric of doom is alive and well, as the lead up to the entirely-avoidable “fiscal cliff” in the United States testifies. It seems like we always enjoy flirting with disaster. And in the spirit of disasters and catastrophes, I’d like to make a prediction. The notion of environmental security will become far better known in 2013. Sure, we all like laying blame when disasters strike. After Hurricane Katrina hit New Orleans in 2006 and broke the levees, the Federal Emergency Management Agency, or FEMA, became a household name and President George W. Bush took a lot of political fire for not handling the disaster well. And since that time, with hurricanes continuing their dirty work in highly populated areas — as in the case of Hurricane Sandy’s 2012 havoc in the Northeast USA — we will continue to ask important questions about whether these are entirely natural events, whether global climate change is responsible, whether we are responsible for that, and then the hardest one: who is responsible for protecting us? As extraordinary natural events affect more people, Americans are going to become more acquainted with a kind of national security that attempts to gauge the sources and effects of major events in the natural world, such as famines, disease, floods, earthquakes, hurricanes — you name it. Maybe you haven’t heard of it. If not, now you have: it’s called environmental security. You might say it’s a trendy kind of national security. Not all security wonks care about it, because it’s nontraditional. Perhaps they see it as the product of tree-huggers horning in on territory typically occupied by military analysts. But environmental security has a lot advocates within the national security establishment, including high-ranking military figures who want to show that Americans’ lives depend on better knowledge of environmental threats. It has spawned specialized security blogs such as The Center for Climate and Security, and the New Security Beat at the Woodrow Wilson Center’s Center for Climate Change and Security. NATO has taken steps to put energy and the environment on their agenda in a way that seems more sincere than its attempt to do it in the 1970s. It’s not simply because civilians might be harmed (certainly the case), but also because the world’s hotspots of conflict are often “hot” precisely because the people live on the edge of some threatened natural resource, such as access to food and water, or because they are particularly vulnerable in some other way. I’ll be doing my part trying to alert people to it, and I also want to make the point that it is not simply a new trend. It has deep roots. 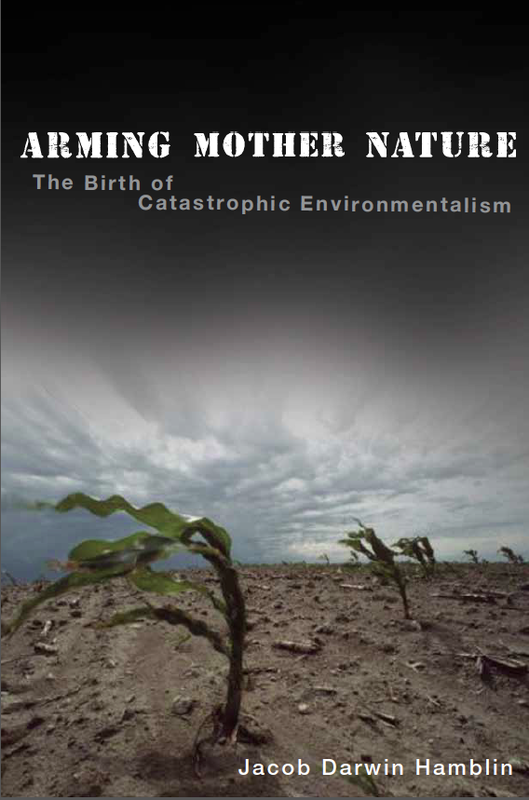 I’ll be spending much of the year promoting my new book Arming Mother Nature: The Birth of Catastrophic Environmentalism (Oxford) which puts a different light on environmental security. I point out that a lot of military and scientific work in the Cold War tried to exploit those vulnerabilities, with biological weapons, radiological weapons, and even weather warfare. All with the goal of maximizing the number of humans killed, using the tools that Mother Nature might provide. But in those decades, too, more and more people tried to figure out ways to protect people, and to imagine all the different ways that we as humans are vulnerable to the vagaries of the natural world, and to nature’s manipulations by humans. Scientists tried, as Herman Kahn once wrote, to “think the unthinkable” when they imagined World War III, and those thoughts went far beyond nuclear conflict. Instead they asked: what if we have armed the natural world against ourselves? 2013 is going to be the year. That’s my prediction. Does that mean I’m predicting a massive natural disaster? Not necessarily. It may be that the existing momentum for environmental security, and the real experiences of the past year, will be enough to motivate people to take pragmatic steps toward decreased vulnerability to natural events. Or it may take a few more catastrophes before that happens. ← Where should historians send policy-relevant scholarship?